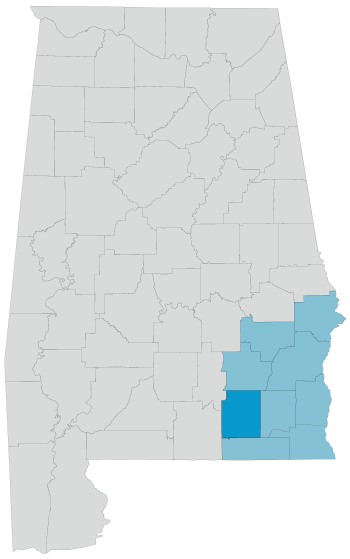 Coffee County is located in the southeastern corner of Alabama. The cities and towns inside of Coffee County include Enterprise, Elba, New Brockton, and Kinston. The largest city in Coffee County, Enterprise, is one of the three cities that form the border around Fort Rucker, one of the largest military installations in the state. Fort Rucker is home of the US Army Aviation Center of Excellence and is a primary training facility for most military helicopter pilots. According to the most recent census, Coffee County has a total of 49,948 people residing within the county.